This Cyber Monday offer is valid today only (December 1st) until midnight PST. 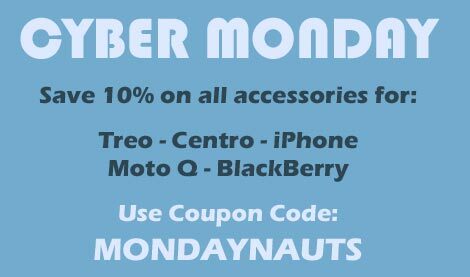 Simply use coupon code MONDAYNAUTS in your cart during checkout to apply your 10% discount. Separately, you can also get 20% Off all Palm OS software and Windows Mobile Software by using coupon code BESTSELLERS.